As we age, several changes in individual cells and organs of our body occur gradually, depending on genetic, environmental factors and life style, and vary from person to person. Following a healthy lifestyle and eating 12 best anti-aging foods in your daily diet can help slow the aging process. Aging is responsible for an overall decline in body's performance including deterioration in vision ability and hearing power, muscle strength and immunity weakening, skin and blood vessels becoming less flexible, and many more. Find a lsit of best anti-aging foods for women and men. Following a healthy lifestyle, staying active and eating a nutrient rich diet can help slow the aging process. A healthy lifestyle is an important factor in healthy aging and longevity. Including antioxidants foods into your daily diet can delay the effects of aging. The anti aging foods should include antioxidants (antioxidants foods), vitamins and minerals from carbohydrates, iron (foods high in iron), proteins, healthy fats, nuts, whole grains, spices and herbs. There are several anti aging products available in the market, but you can eat the following anti-ageing and longevity foods to fight aging and adding years to your life. Avocados are loaded with anti-ageing vitamin C and vitamin E and Omega 3 fatty acids, which make our skin soft, supple and glowing. They can also reduce wrinkles. All berries such as blackberries, blueberries (Blueberry nutrition facts), cranberries, blackcurrant, red grapes and black grapes contain powerful antioxidants, phytochemicals which fight oxidative damage causing the age-related problems. 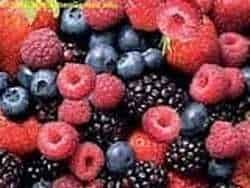 The berries have been shown to slow the growth of certain cancers as well as improve brain function, motor function, muscle tone and balance (Blueberry health benefits) . The grapes contain an antioxidant called resveratrol, which has anti-inflammatory and anticoagulant properties, promoting heart health. Spices such as turmeric, garlic and ginger are anti-inflammatory, antiseptic, antibacterial and antiviral properties that might reduce the risk of age-related conditions such as Alzheimer's disease. "Turmeric is a powerful antioxidant which stops lipid oxidation and is anti-inflammatory...It is a possible aid in preventing chronic degenerative diseases like Alzheimer's disease." says Cohen, in his book, Herbs and Natural Supplements: An Evidence-Based Guide. Eating garlic and onions daily can reduce high blood pressure, lower cholesterol and triglycerides, dilate blood vessels and protect the body against cancer and heart disease. It is also helpful in fighting skin infections and treating intestinal and respiratory infections. Cinnamon may help lower blood sugar. In addition to the above anti-aging foods, honey is said to be useful in the fight against memory decline and anxiety during ageing. You can drink hney in lukewarm water in the morning. Nuts and seeds are concentrated sources of vitamin E, potassium, magnesium, iron, zinc, copper, selenium, unsaturated fats and omega-3 fatty acids and antioxidants, so they can slow down the ageing process. The anti-ageing food like sunflower seeds help look younger, improve skin softness and reduce wrinkles. Eating 1 or 2 Brazil nuts, a very rich source of selenium, daily helps slowing down the ageing process. Almonds and walnuts contain vitamins, healthy fats and protein that benefit cardiovascular and brain health. Olive oil contains monounsaturated fats and polyphenols, powerful antioxidants which may help prevent age related diseases. Drinking tea can lower conditions such as heart disease, cancer and Alzheimer's disease. Tomatoes are a rich source of antioxidants including lycopene. Eating tomatoes daily can prevent heart disease and cancers of the lung, colon, stomach, mouth and prostate. Do you know that cooked tomatoes are better than raw tomatoes! Know all tomato nutrition facts and health benefits. The dark green vegetables like broccoli, cabbage, cauliflower, radish greens, turnip, Brussels sprouts and watercress are rich in vitamin C, folate, calcium, carotenoids and anti-cancer substances such as sulphoraphane and genistein. Diets high in these vegetables can protect us from cancer, memory loss, cataract and macular degeneration in eyes. Whole grains, legumes and lentils are rich in complex carbohydrates, protein and dietary fiber. They can lower the risk of age-related illnesses like heart disease, high blood pressure and cancer because they are rich in fiber, vitamins, antioxidants and minerals. Whole grains are digested slowly, so they help prevent high blood sugar. The isoflavones in soybeans protect us against breast and prostate cancers, heart disease, Alzheimers disease and osteoporosis. (dahi, curd, yoghurt) helps to boost immunity and improves the absorption of nutrients from the gut. Due to vitamin D deficiency and a result of natural aging process, Senior people are at risk of developing heart disease and diabetes. You can reduce this risk by sitting more time in the sunshine to boost vitamin D in the skin, it is free! You must have noticed from the above list of manti-aging foods, that except honey, all are plant foods. You can grow many of these foods in your garden quite easily. Try growing vegetables like broccoli, cabbage, cauliflower, radish greens, turnip, Brussels sprouts, etc., berries like blueberries, cranberries, strawberries and grapes and spices such as as turmeric, garlic, ginger and onions. Studies are also going on to reveal the health benefits of bottle gourd (how to grow bottle gourd).